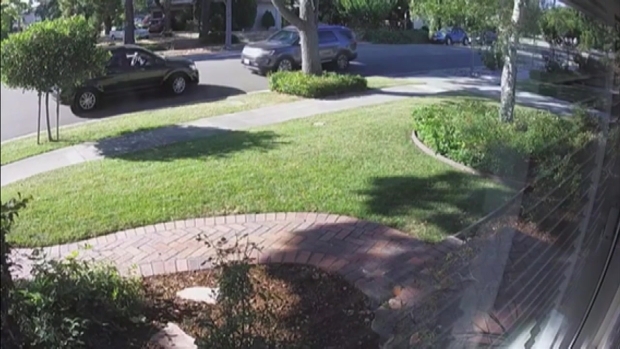 A woman trying to steal a package from the front porch of a San Jose home not only was caught on video, but also was confronted by the homeowner on the street. The attempted robbery happened Wednesday afternoon in broad daylight. The resident, Heidi Burrows, is seen in surveillance footage driving up as the thieves put the package in their car and start pulling away. Burrows stops in front of the suspects' vehicle, and the thieves are seen throwing the box out the window before speeding away. The security camera captures the entire theft, with the woman walking up to the front porch and bending over to pick up a box. She then trots down the front yard to a waiting Dodge SUV and tosses the box into the vehicle through the front passenger window. Just as she gets into the back seat, Burrows arrives home and sees what’s happening. Burrows recalled saying to herself, "Wait a minute! They’re stealing my boxes!" Surveillance footage shows a woman stealing a package from the front porch of a San Jose home then the victim confronting the thieves as she arrives home. In the video, Burrows is seen stopping her SUV inches from the culprits' vehicle. Burrows said she got out of her vehicle, shouted at the thieves and took pictures of their license plate to give to police. "All of a sudden, I just see the box fly out of the window, and they go tearing off," Burrows said. One neighbor says there have been a few minor incidents in the neighborhood over the years, but he was shocked when he saw the video. "We had our spare change stolen out of our unlocked cars, but that’s about as far as any trouble in this neighborhood," said Richard Hahn. Burrows said she's had a package stolen off her porch before and shared the picture of that thief. He made off with a box of shampoo. The thieves Wednesday would have made off with packaging supplies, she said. "It’s funny because I had three boxes of boxes on my porch, and as I was driving up and I rolled down my window, I heard them yell, 'Get the biggest box,'" Burrows said. Burrows said she never intended to confront the attempted robbers. She only wanted to get a picture of their license plate. But she started shouting at the pair when she realized they looked like a normal, middle-aged couple.